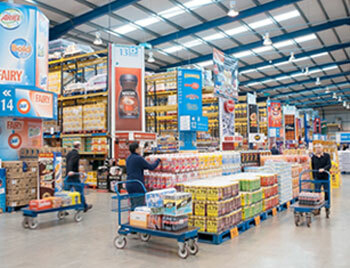 Established in 1976, Bestway Wholesale has grown to become the UK’s largest independent food and drink wholesaler. It is part of the industrial giant Bestway Group which also has global business interests in Banking, Cement, Pharmacy, Milling and Property Investment. The wholesale division has 65 Bestway and Batleys depots spanning the length and breadth of the UK. It is a supply partner to over 70,000 independent retailers and 40,000 catering and foodservice operators. With a UK turnover of £2.5bn and a comprehensive logistical infrastructure, the company has the scale, purchasing power and expertise to help our customers compete in an ever-changing food and drink sector. As a business, Bestway Wholesale business services three main customer groups; independent retail (including Club and Symbol), Foodservice and specialist Pet Operators. Independent retail is serviced by our extensive depot network and delivered operation to stores. In addition to supplying thousands of convenience stores and small shops, Bestway Wholesale also operates the award-winning Best-one symbol group which has 1,400 members throughout the country. Over 3,500 independents have chosen our depot-run promotional club, Xtra Local, as their retail club of choice. These two groups continue to lead the company’s march in supporting customers with the right range, promotions and discipline to meet the exacting needs of the modern shopper. The company recently introduced a multiple account supply division which currently delivers to 28 multi-site operators across a footprint of over 300 stores. The recently launched BB Foodservice continues to drive traction amongst caterers and foodservice operators both in the private, public and local authority sectors. Foodservice is a key growth area for the business with 15 of the company’s 65 depots specialising in delivered foodservice and with a dedicated Contracts Team responsible for providing bespoke solutions to foodservice operators ranging from hospitals, prisons to educational establishments within local authorities and private institutions. The company also operates the largest pet-specialist wholesaler in the UK under its Bestpets brand, which supplies over 4,000 specialist pet stores with specialist animal feeding, pet healthcare and accessories. Among these customers is a 400-strong Bestpets fascia operation, Bestpets Local, which provides local pet specialists with a wide range of promotions and advice to help develop their businesses. The business has invested significantly in its award winning own-label offer: best-one and best-one Inspired for retail; Essentially Catering for foodservice; and Bestpets for pet care. There are now more than 1,300 lines in our own label portfolio offering everyday value to customers and shoppers. We are committed to providing quality as well as value and, over the past year, both our retail and catering own label ranges have received awards for their quality credentials. The company’s mission is to be the ‘Best Way to Grow your Food and Drinks Business’. We strive to do this by offering customers a comprehensive range of products and promotions at sector-leading prices, unparalleled availability and customer service which is second to none.